Sigh, do kids these days not watch A Christmas Story? 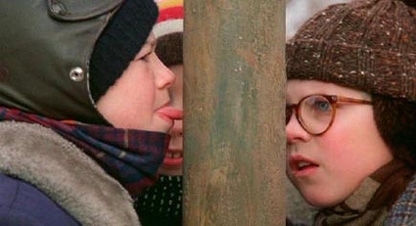 Or are kids sticking their tongue to frozen metal poles because of A Christmas Story? I guess that’s the question for the ages after an 8-year-old boy licked an icy stop sign pole and froze his tongue to the metal, requiring the aid of rescue crews in Woodward, Oklahoma. The boy was dared (by his brother, no less) to lick the metal pole holding up a stop sign across the street from Woodward Middle School. He did so. His tongue got stuck. When rescue crews arrived, they found the boy standing on his tip-toes, trying valiantly to wrench his tongue from its frozen position against the ice-cold signpost. Paramedics were able to free him from the post by pouring water onto his tongue, which is the same way I get my car door unfrozen.